1 NOTE: you may need to activate the Spatial Analyst extension to access some of the tools needed for this lab. NOTE: you may need to activate the Spatial Analyst extension to access some of the tools needed for this lab. Task 1 is really all about getting four different resolution DEMs for our study watershed (Big Cottonwood Canyon) into ArcGIS and then displaying them in a useful format. This sounds like a straight-forward task, but in reality it is a somewhat nuanced exercise and takes a while to get everything in exactly the format you want for the areas you want. This is typical of working with raster data provided from others (Utah AGRC in this case). Download* and unzip the Watersheds_Area_shp or _gdb file from the Utah AGRC for the state of Utah. After lab 4 you should appreciate the differences between the two formats. Load the Watersheds_Area polygon feature class for Utah into an empty map document. Add an imagery basemap for context. 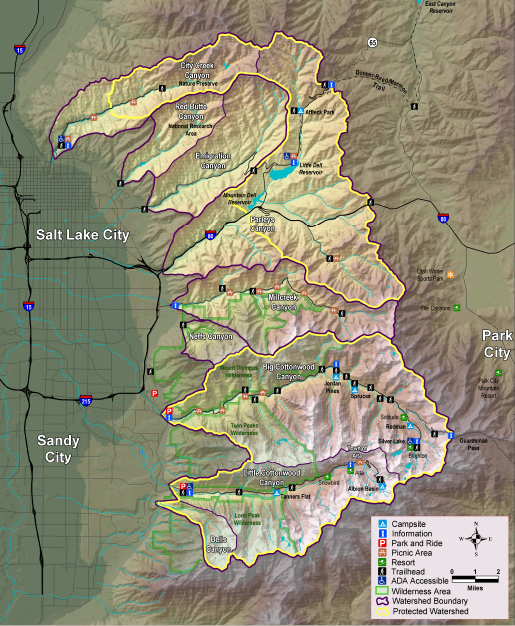 I would suggest exporting just the Big Cottonwood Canyon Watershed to its own shapefile or feature class. The problem is that it would take a VERY long time to download all 51 tiles individually, then load them up, perhaps combine them into one very large raster layer (e.g. using the mosaic command). If at the end of lab you're feeling particularly ambitious and have extra time, feel free to undertake such a brute force exercise for extra credit. However, for the rest of us, this is a perfect example of where we may want to make an executive decision to limit our download and processing time up front, and instead, create an detailed visual comparison using a subset of the LiDAR data, and make a compelling case to the client detailing the pros and cons of using high resolution lidar data. Lets download just the two tiles that cover most of the Solitude Ski Resort. We will use these two tiles to illustrate to our boss and the Cottonwood Canyon Foundation the nature and resolution of the 2m LiDaR DEMs in Task 1, and do the requested comparison in Task 2. To figure out these tiles, I zoomed into the area around Solitude (easy to spot from aerial imagery basemap layer if you've been there, but also easy to confuse with Brighton). The video shows you how to choose the tiles. The LiDaR tiles we want from Utah AGRC are 12TVK480940 and 12TVK480960. There are several options for downloading these tiles ranging from an FTP listing to various interactive maps. Each has its own advantages and disadvantages. I chose to download these from the 2 meter Bare Earth LiDAR Interactive Map because I knew where to navigate to within the map (note because the raster is an ASCII text file, if you left click on it it may just open the text file in your browser; try right clicking instead and Save Target As. If your browser doesn't allow this, try switching to Internet Explorer). There are multiple places in the simple step of converting and loading the ASCII raster DEMs into a more useful form in ArcGIS that folks get confused and get derailed. As ASCII raster data is such a common form in which DEMs and other raster datasets are made available, these are essential skills to develop and understand each step. The video tutorial provides you with a little extra explanation and step-by-step explanation of the steps described in the Using ASCII Files in ArcMap instructions from the Utah AGRC. Note, you will find these rasters display quicker if you Build Pyramids for them (right click on the raster dataset to access this command). Note: If this process doesn't work, Run the ASCII to Raster tool (Conversion) - saving the ascii files as *.TIF files, then the Mosaic to New Raster tool which will combine the two new TIF rasters. Make sure you set the XY and Z coordinate systems for the New Raster in this second step. Don't include a file extension. Pixel type and Bands should match the input rasters (check the properties). If you use the interactive download map, the tiles that intersect the Big Cottonwood Canyon Watershed are those highlighted in orange above. You will notice that like the LiDaR rasters you download, these are also Arc ASCII Raster (*.asc) files. You will need to go through a similar process as with the LiDaR rasters above to covert these into a useful format (don't forget about projection... check the metadata they provide). Warning: each of these four rasters is 125 MB in size and the Mosaic step may take a fair bit of time (i.e. 5-15 minutes depending on your computer's speed). Although DEMs are very useful, by themselves, raster DEMs don't display the topography by default in a way that makes the terrain jump out at you. It turns out that the context we like from DEMs is best provided by a product derived from DEMs - a hillshade. Moreover, to compare different DEMs effectively, we want to use the same display properties (i.e. color ramp and elevation classification). There is no single correct way to make your maps for Task 1 and we will leave that up to your creativity and professional judgment. You may find that either implementing a display clip (of a data frame) or a physical clip of the raster dataset to the watershed boundary are extremely useful tools to have at your disposal. This video tutorial goes through an example of each with the 30 m DEM. See the what to submit section for Task 1.